Del. Veronica Turner’s bid to unseat incumbent Sen. Anthony Muse just got a major shot in the arm. Together with Del. Kris Valderrama and David Sloan, Turner has formed the District 26 Unity Slate. As I explained in my profile of the D26 Senate race, the alliance with Sloan had been rumored for awhile. Valderrama’s participation also does not shock. In 2010, Muse did not endorse Valderrama and then accused her of disseminating misleading information about him. Like Turner, Valderrama is perceived as more progressive than Muse. Both Turner and Valderrama backed marriage equality despite Muse’s fierce opposition and criticism. Del. Jay Walker joined Muse in speaking at a tea-party organized rally against it. Walker is supporting Tony Knotts for delegate so this seems a tacit rival to the formally announced D26 Unity Slate, as only three people can win election as delegate. I don’t know if Walker or Knotts are running with Muse. Though this would seemingly be the logical next step, the presence of five other candidates besides Valderrama and Sloan may complicate matters. 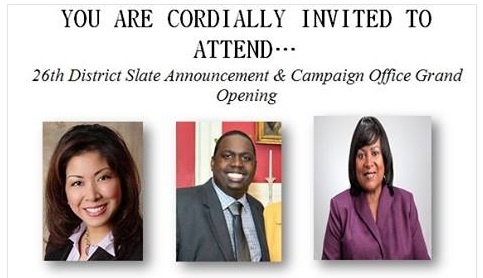 The District 26 Unity Slate held their first event on Monday at Mrs. Philippines Home and will hold their office opening on April 12th. The ticket works to the advantage of all the candidates as they benefit from mutual support and can multiply the impact of money and canvassing by working together. Of course, they also lend each other credibility in their campaigns.